Frequent travelers will know only too well how important it is to keep some snacks on your person at all times. Whether you're waiting in an airport or trekking through a forest, it's always vital to have some tasty treats and hydration on hand to keep your energy levels up, and it can be so easy to overlook this simple fact. 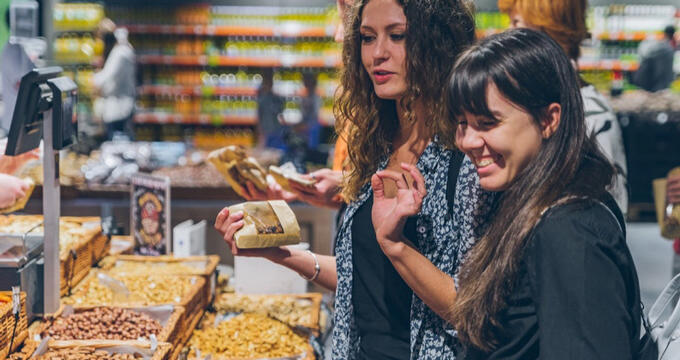 Too often, travelers find themselves hungry or thirsty, without any option other than to pay over the odds at a vending machine or store, usually forced to pay candy bars or other basic junk food items to enjoy a quick sugar boost and face the challenges of the travel ahead, and this is why it really pays off to invest in some healthy snacks before you head out. You are what you eat, after all, and that old saying is especially important to bear in mind when you travel. If you're moving around a lot and really want to make the most of your days without suffering from fatigue or the other side effects of hunger, having some health-boosting items in your pack is a big bonus. Read on to learn all about some of the best healthy snacks for travelers to pack before their next trip. Nuts are packed full of protein and are a great healthy snack to keep around at all times, especially while traveling. They can be easily stored in little bags and you only really need a handful to get a good energy boost. One of the best things about nuts is that you can do a lot of different things with them. Pine nuts are a great example. They can be roasted and mixed up with various herbs and spices to take on a whole new flavor. They're also filled with lots of nutritional minerals and vitamins, offering plenty of healthy benefits with every crunch. The health benefits of hummus are enormous. Offering lots of plant protein in every serving, along with plenty of nutritional ingredients to boost your immune system, reduce inflammation in the body, control blood sugar ingredients, and lower the chance of heart disease, hummus really is a superfood and tastes great too. Hope Foods offers a huge range of hummus varieties, with flavors like Spicy Avocado, Thai Coconut Curry, Kale Pesto, and Original all available. Regular fruit can be great and has a lot of awesome health benefits to offer, but as anyone who has ever forgotten a banana or apple at the bottom of their bag can testify, fresh fruit can go bad pretty quickly and make a big mess. That's why dried fruit is often the better option when traveling. Available in all shapes and sizes, from banana slices to raisins and apple chips, dried fruit can be enjoyed at any time of day by any kind of traveler. Big Spoon Roasters is back again with another amazing nut product to make your travels so much more enjoyable. Available in a great range of flavors at excellent prices, these nut butter bars are formed with different types of nut and lots of extra ingredients like figs, cranberries, and cherries to add some fruity fun to each offering. Find your favorite flavor and start enjoying the benefits of these awesome, protein and vitamin-packed bars on your next journey.